Last week we discussed several tips for working with a professional stager to stage your Carmel, IN home. Unfortunately, paying for a professional stager is not in everyone’s budget – even if you will see that money back at the closing table. If you need to sell your Carmel, IN home quick and must do the work yourself, don’t despair! With a few tips you can get a professional-looking result from your own hard work. Not all paint colors are created equal. When you stage your home, you are trying to appeal to the majority of people. This means that neutral colors are best, such as whites, off-whites, beiges and creams. Light colored walls will also make your rooms appear larger. Luxury in the Bathroom. Carmel, IN homebuyers love a good bathroom. The secret to staging is to make the bathroom look like a hotel. Clear all the clutter off the bathroom sink and counter, except for a few products with attractive packaging and aromas. Add a potted plant, a basket full of rolled up white towels, and a candle. Style the coffee table. Potential homebuyers notice what is on the coffee table in the living room. Again, remove all the clutter, and design it with a large centerpiece. This could be a pot or vase with flowers, an attractive bowl or dish, or an art piece. Build out from there, with items like candles, small stacks of books or magazines, or sculptures or pottery. Bedroom seating. 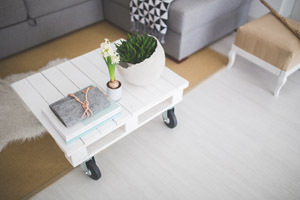 Part of staging is getting the furniture to look appealing to a potential homebuyer. If you have space in the bedroom, it’s a good idea to add some sort of seating. This could include a bench at the end of the bed, or a chair and side table in the corner. It makes the room seem larger, and it looks warm and inviting. Layer the lighting. Ceiling lights can leave a room looking flat, or too bright and fluorescent. Create a good mix of lighting including ceiling, various heights of lamps, and pendant lamps where appropriate to help fill in the room with layered light. If you are starting the process of selling your Carmel, IN home or thinking about doing so this fall, please contact a Carmel, IN real estate agent and we can point you in the right direction. We are well versed in what it takes to get the job done.